How to transfer spotify playlist to tidal? Representatives describe TIDAL as, “a single destination for artists and fans to share ideas, exclusive content, songs, videos, studio sessions, rough tracks, personal conversations and more.” TIDAL is also a destination for subscribers who want to listen to music at a higher quality than you find on Spotify. This service provides Lossless High Fidelity music and it upgraded the Premium offering to better match Spotify’s highest music quality setting. This move makes the comparison more favorable for TIDAL. What’s more, Spotify offers over 30 million songs and TIDAL boasts 48.5 million. Another reason that some people are trying Tidal or switching to Tidal is the Tidal exclusive tracks. -- How do artists upload songs to Spotify? After some contemplation, you may decided to cancel your premium Spotify subscription and go all in on Tidal. Then you will ask how to move the large playlist within Spotify account to Tidal. 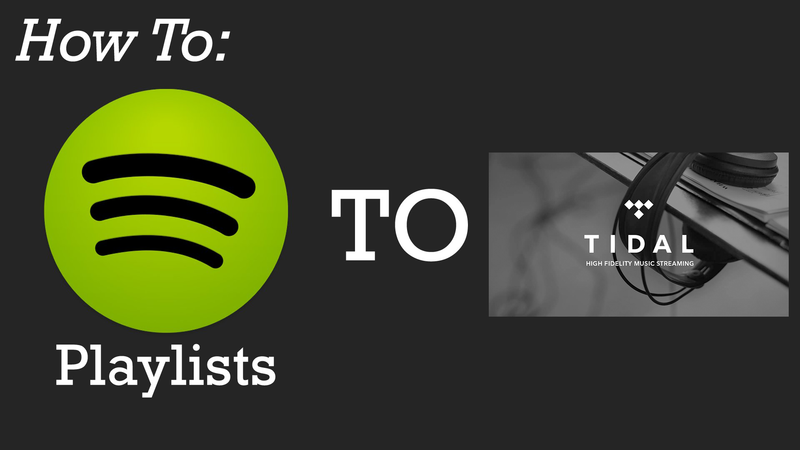 The following guide will show you two ways to transfer your music from Spotify to Tidal easily . 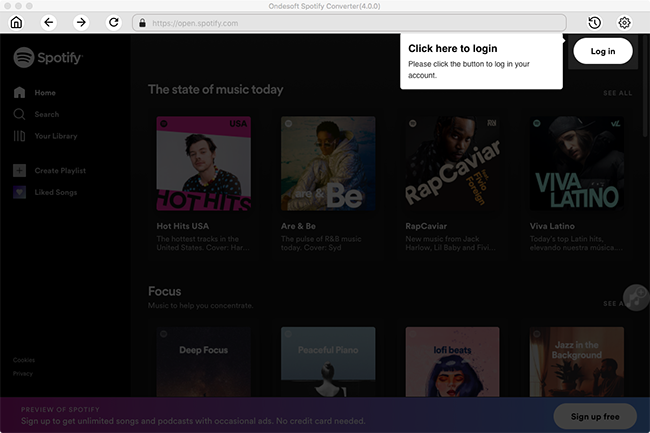 Soundiiz is a website available to transfer playlists between 2 streaming services, Tidal and Spotify are supported, but you should have a Spotify Premium account so that you can download Spotify music to your computer. If you do not have a Premium account, you can use the second method to download Spotify songs first. Step 1: Open the website URL http://soundiiz.com and create a Soundiiz account. Step 2 : Click on Platform to Platform in left panel of the interface. Select Spotify as source service (and connect this platform). Step 3: Choose categories you want to transfer (playlists, albums, artists, tracks) by checking the corresponding box in left. Step 4: Select TIDAL as destination service (and connect this platform). The process start. The transfer process run in background. You can see batch progression in real time in your Batches list. Once finished and if tracks have been found, your playlists will be available on TIDAL. 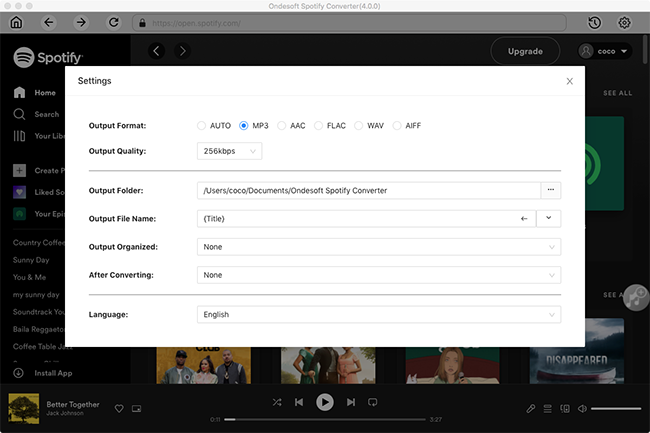 Ondesoft Spotify Music Converter is designed to remove Spotify DRM protection and convert Spotify songs to MP3, M4A, WAV and FLAC. Both Spotify Premium and Free users can use it to transfer Spotify playlists to Tidal . 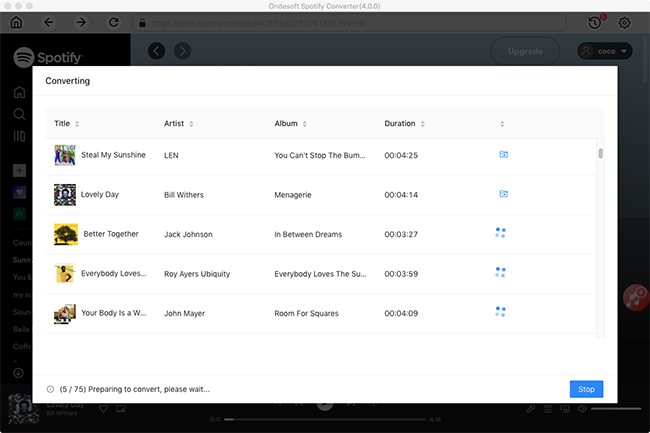 Step 1: Download, install and run Ondesoft Spotify Converter on your Mac or Windows. 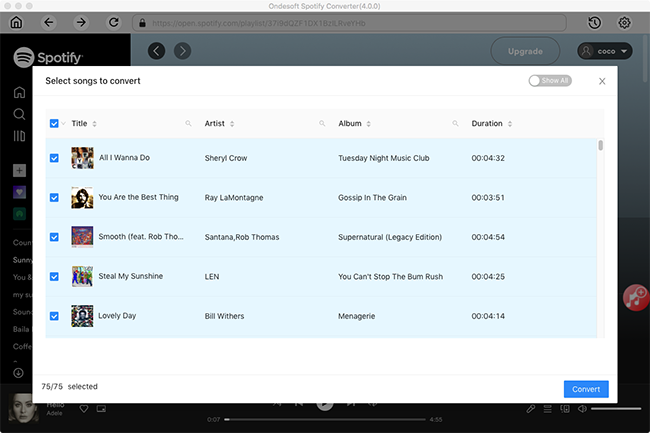 After you open Ondesoft Spotify Converter, the Spotify app will be launched automatically. Step 2 Drag songs, playlists or albums from Spotify app to the interface directly. Then click the Add button. 3. Click the Options button to choose MP3 as the output format. Then click the Convert button to start converting Spotify music to MP3. You can also change the output quality, bitrate and output folder as you prefer. Step 4 After the conversion, click the History button, you will find all converted songs on your computer. 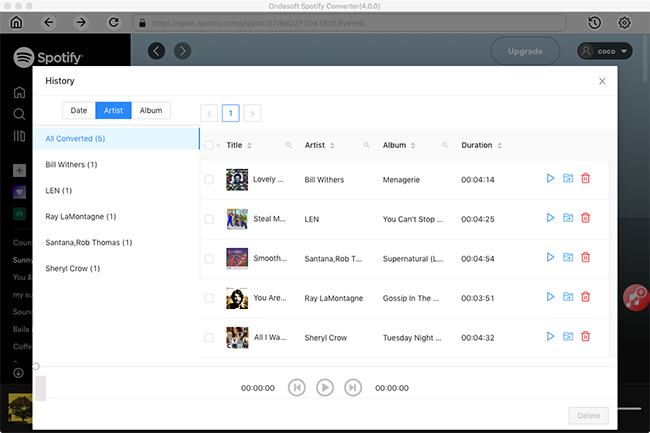 Step 5 Upload all converted songs to Spotify music app or iTunes, then use Soundiiz to transfer them as the first method mentioned.